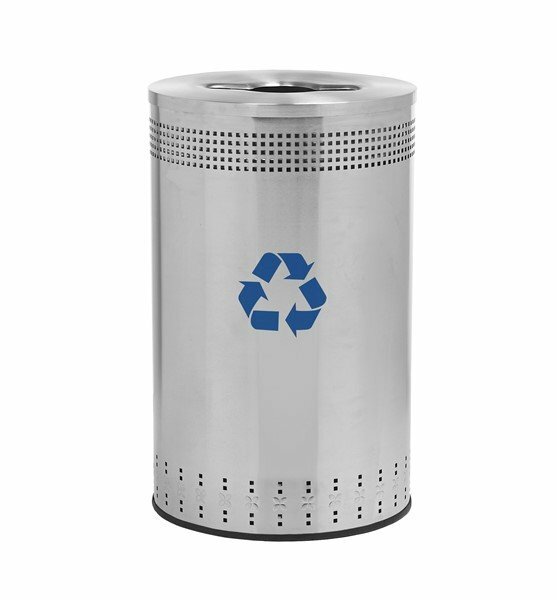 45 Gallon Precision Steel Round Recycling Receptacle with Recycler Top - 39 lbs. 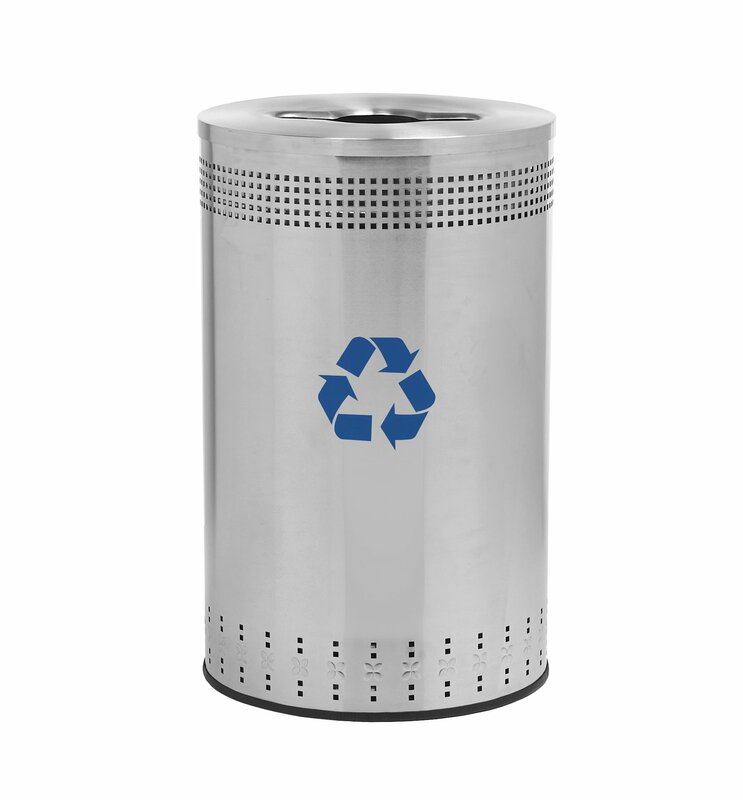 This 45-gallon Precision steel round recycling receptacle with recycler top has an imprinted design that looks great in entryways, restrooms, and high trafficked hallways. CConstructed out of smooth heavy gauge 304-grade stainless steel, this large capacity trash can will resist rust, both indoor and outdoor. The top is designed to allow enough room for bottles and paper to be inserted through, preventing guest from disposing of unnecessary trash, while creating awareness of the recycling receptacle. Includes such decals as cans & bottles, mixed, organic, paper, glass, aluminum, plastic, and a blue 7" x 7" recycle logo to clearly distinguished the receptacle to meet your exact needs. Featuring a rubber ring base to protect the floor from damage and a galvanized liner with handle for easy recyclables removal. 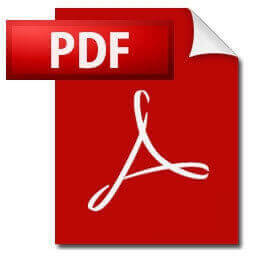 We offer a 1-year warranty for this receptacle, however, it will give many more additional years of low maintenance service. 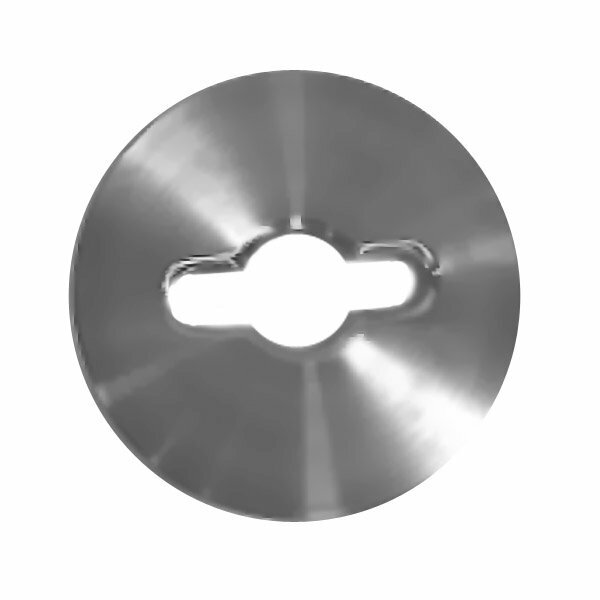 • Dimension: L 21" x W 21" x H 34"
45 Gallon Precision Steel Round Receptacle with Open Top - 39 lbs. Skyline Stainless Steel Backless Bench - 4 Ft. or 6 Ft.
41" Smokers Outpost Commercial Smoke Stand Aluminum Cigarette Disposal - 22 lbs. 33 Inch Tall StoneTec Commercial Planter - 102 lbs.